We want you to feel comfortable in coming to meet us and also to know that our therapy package fee are design to give you a long term support that the therapist market cannot match. Our guarantee to you is high results, clinical comfort, confidentiality, long term support and a one off, well priced fee structure with a service level guarantee for as long as we are in business. Let's talk soon. Come and discover how we will help you. 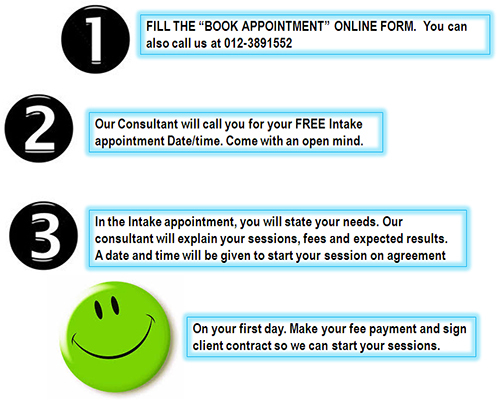 Fill this online intake appointment form and our consultant will call you soon. Book a FREE Intake appointment to find out how you can be help. It is important to meet face to face and discuss the issues and know what solutions are available for you. Your needs are important to us. We are focus only towards your desired results. That's why in Hypno Station, we receive clients from Middle East, China, USA, Europe, Indonesia, Singapore, Thailand, Phillipines, East Malaysia, etc. In Hypno Station, all our Hypnotherapy Clients is valued as our Key Mission! The blend of spirit, energy, dedication, and desire to serve our Hypnotherapy Clients and give them extraordinary delight. Giving Long Term Results is our Expert Strength. We have today hypnotherapy clients from all over Asia, Middle East, Europe, Australia, North and South America and Japan. We often get hypnotherapy referrals from medical personals and centers. Our hypnotherapy track record and success is proven nationwide with high success. Only 20 minutes on the Kesas Highway from down town, 10 minutes from Summit Subang Jaya and two traffic lights from Puchong Toll "
"At Hypno-Station, we strive to make your life experience the best possible. We are always available to answer all of your questions. We will help you feel good every time, anytime and everywhere. Think Hypnotherapy, Think Hypno Station. Professional Hypnotherapy Malaysia Looking for a London trained specialist Hypnotherapy Center that guarantees you success. We have a structured approached to client management in hypnosis that has consistent good results with our clients to acheive their desired results We are located in Call Us Today Tel: 012-3891552 (Client Direct Access). Where: HYPNO STATION in USJ 19 CITY MALL, Subang Jaya Level 2, Unit RL 2-086, USJ 19, Jalan Persiaran Kewajipan, 47620 Subang Jaya, Malaysia When: Oct 15, 7:00PM — Here is my home page: www.hypno-station.com We are in the media, won awards and have more than 11 years of client success as Malaysia's most Premier Hypnotherapy Centre. Book a Free Intake today and we will be in touch soon with the most published proven acheivements in hypnosis.